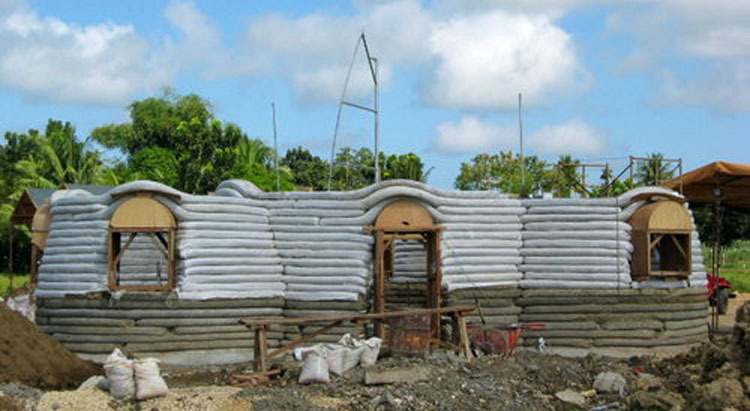 TO PROVIDE an innovative housing solution in the country and worldwide, MyShelter Foundation, a registered Philippine non-profit corporation, introduced the first earthbag shelter system in Escalante City. The Asian Institute of Management Alumni spearheaded the activity. 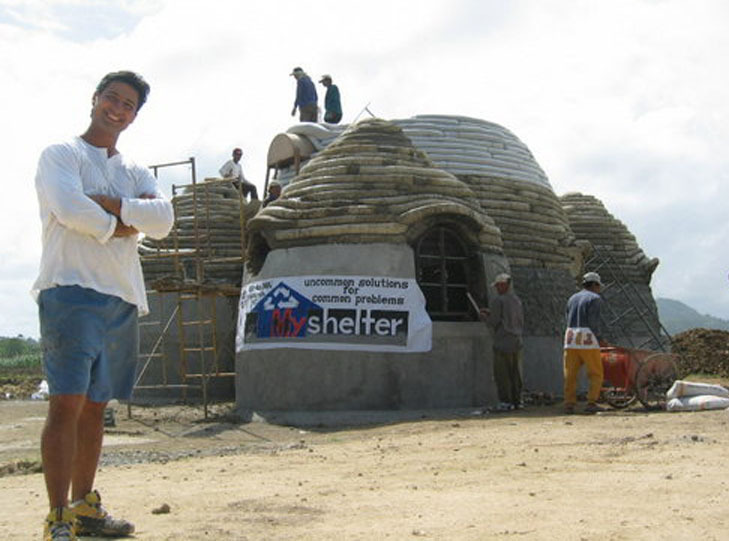 Illac Diaz, founder of MyShelter Foundation, told Sun.Star Bacolod the foundation's aim is to provide housing units as they recognized the growing global need for housing with the country's current population boom. 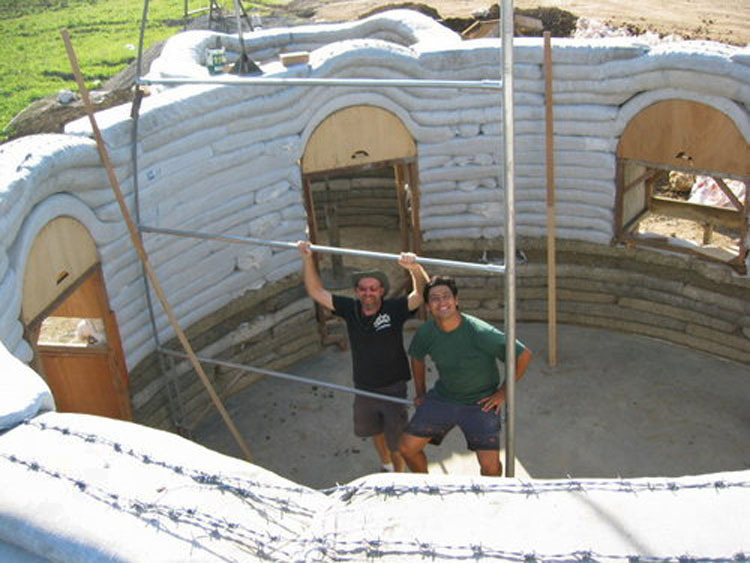 Diaz narrated his trip to California and India to learn the earthbag shelter system to create the first structure. 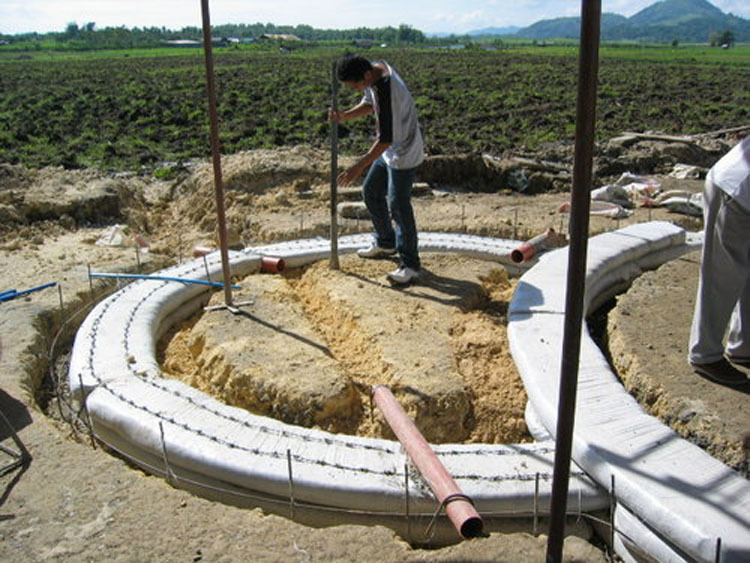 He said the problem can be addressed by using the potentials of earth construction. 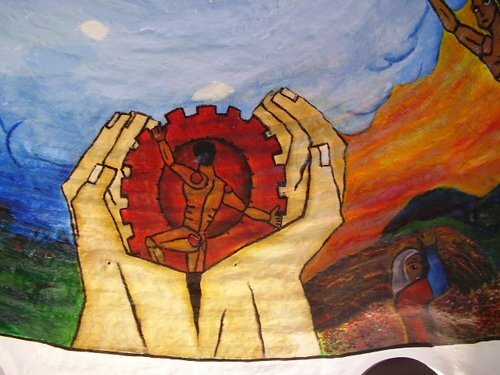 "Our mission is to create and implement innovative solutions for more affordable transitional housing for migrant populations and create sustainable communities that will advance the welfare of the individual and their families," he said. 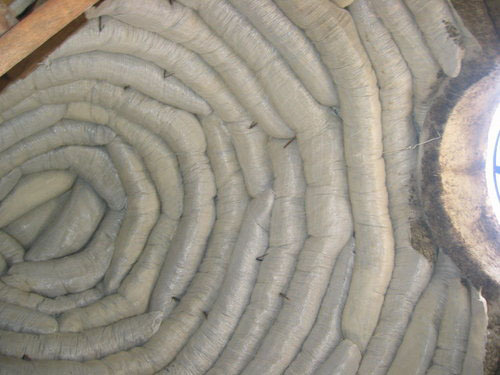 The earthbag shelter system is a low-cost alternative that would use the materials of war (sandbags and barbed wire) to create a safe structure in most regions - without harming the forest. Diaz added this ancient system would utilize minimum amounts of purchased product and maximum amounts of free earth, maximizing potential of available resources by combining it with progressive technologies. He said it would also encourage community activity by working together to put up low-cost, educational institutions, which are easy to build. 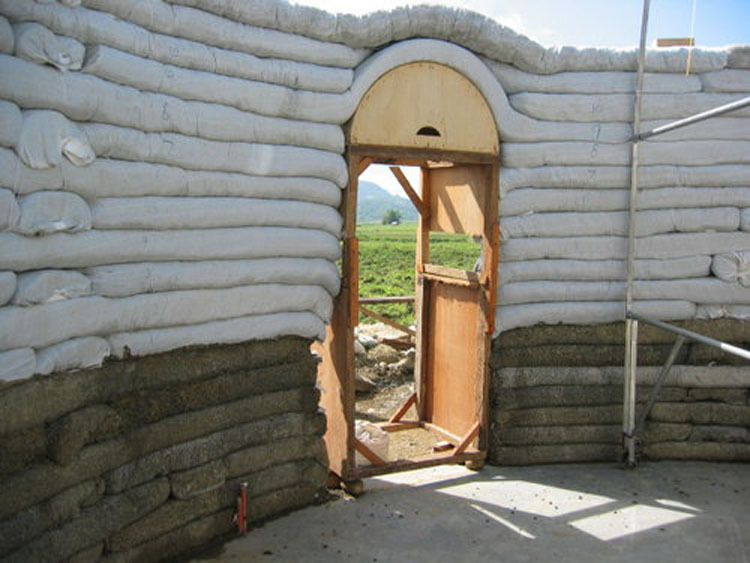 "This structure is also capable of self-insulating, thus, decreasing the need to use electricity," he noted. 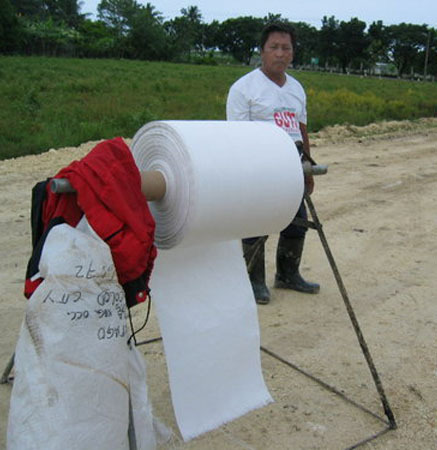 Because of this alternative, saving hundreds of thousands for such structure would mean more money to be allocated for other government priority projects, said Diaz. "This is more environmental, sustainable and economical," he said. 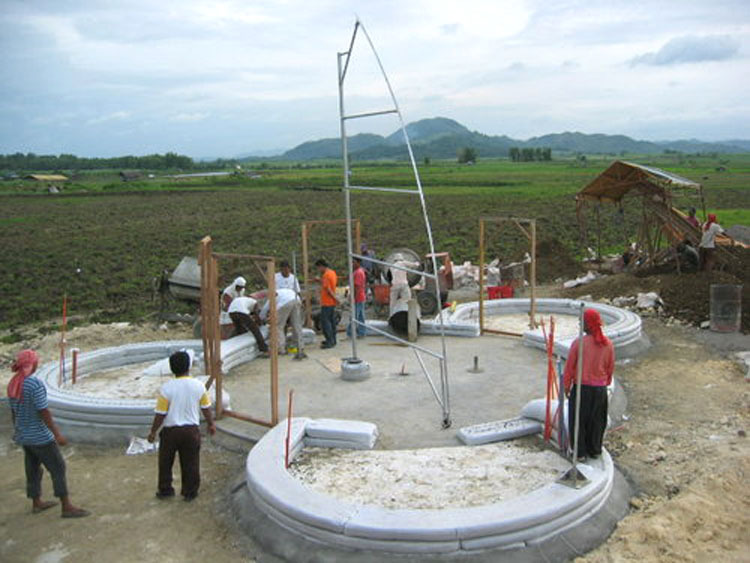 Diaz further said the earthbag shelter system, which provides a dome home structure, is very durable against typhoons. "Every three quarter of the year the Visayas area is widely hit by major typhoons and every debt of several Filipino families has incurred a total of P40 million worth of damages which resulted to loans and more debts," he said. 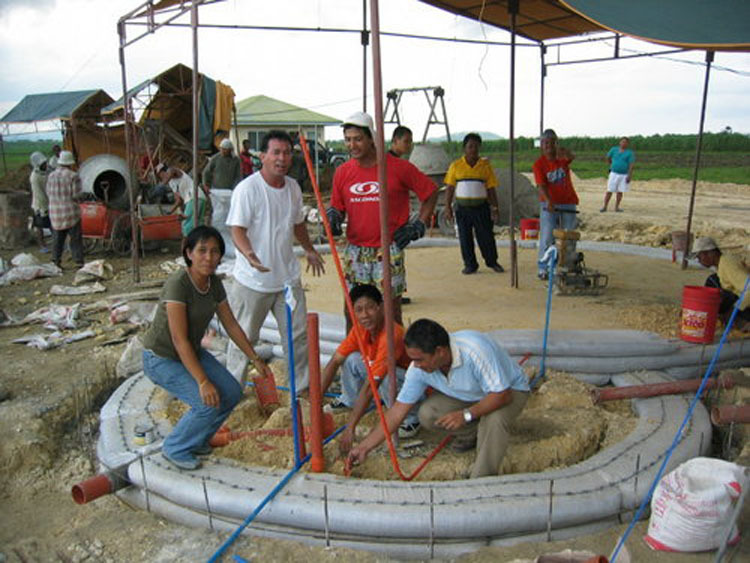 "We could not afford seeing them every typhoon season where they would result to more debts to fix their houses and start a new life again." 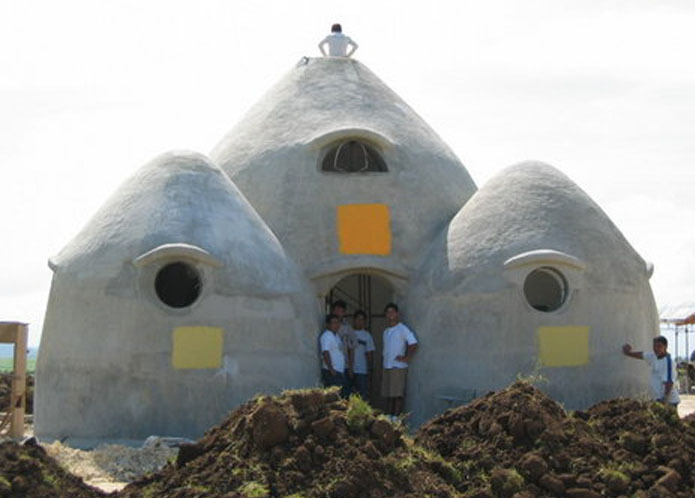 The first structure of earthbag shelter system, Diaz said, was built in Escalante City with a 45-square meter dome house structure that currently serves as a medical clinic. 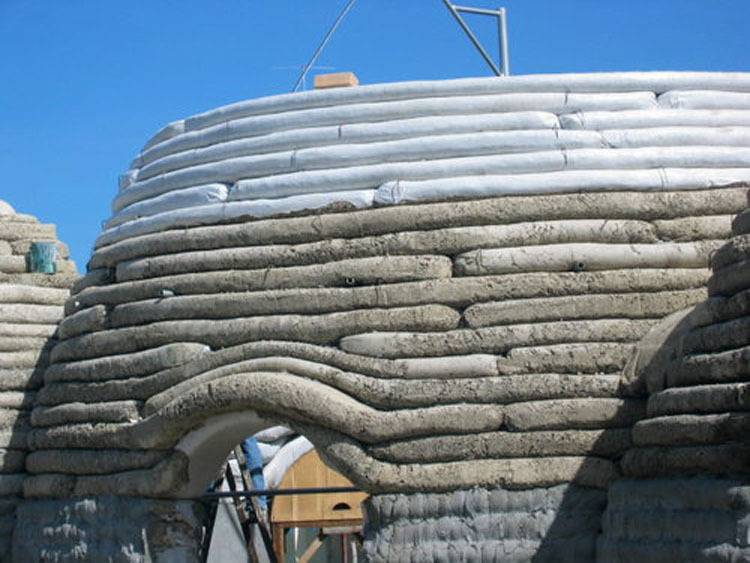 The system uses 80 percent earth, cement, sand, sugar bagasse and sulfur adobe-strong compound which makes it 100 percent more durable, he said. 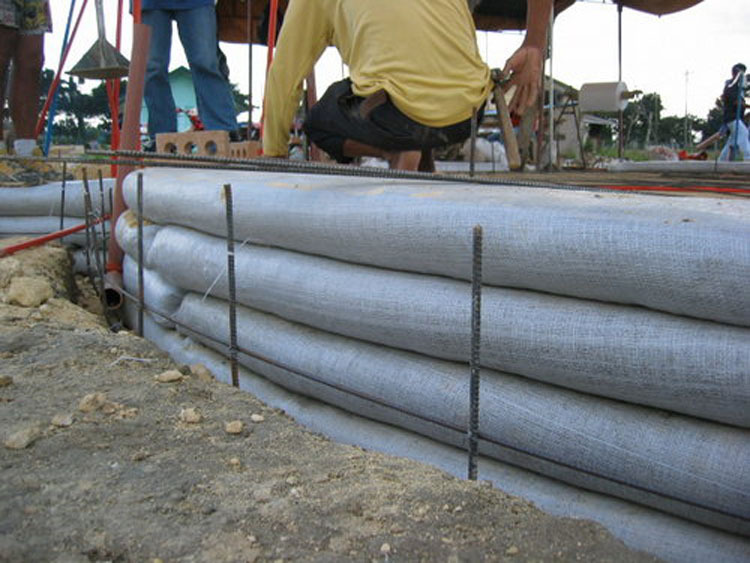 "It is an elongated bricks system mold in sugarcane sacks. 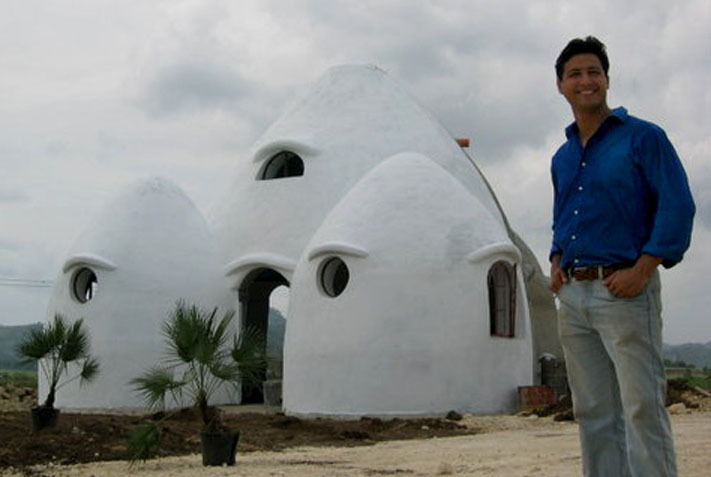 The structure was built within 30 days," he said. 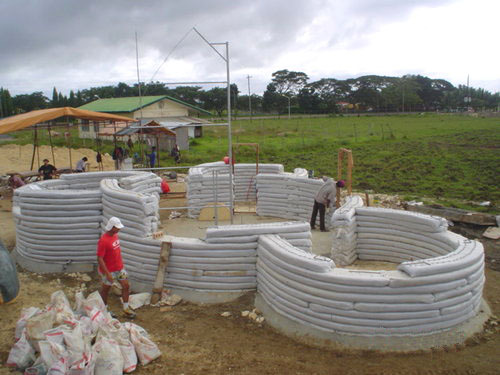 In the near future, with the help of the government for funding, Diaz hoped to build mass structure of earthbag shelter system that would answer the housing problem of the country. 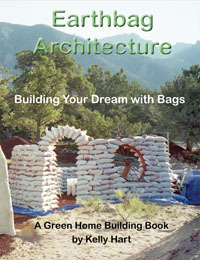 Despite the stern warnings, I packed my gear...for my "sole" itinerary: the dome "houses" of Escalante City. In 2005, the city enjoyed some limelight in national and local papers as well as in many travel and general interest television programs. 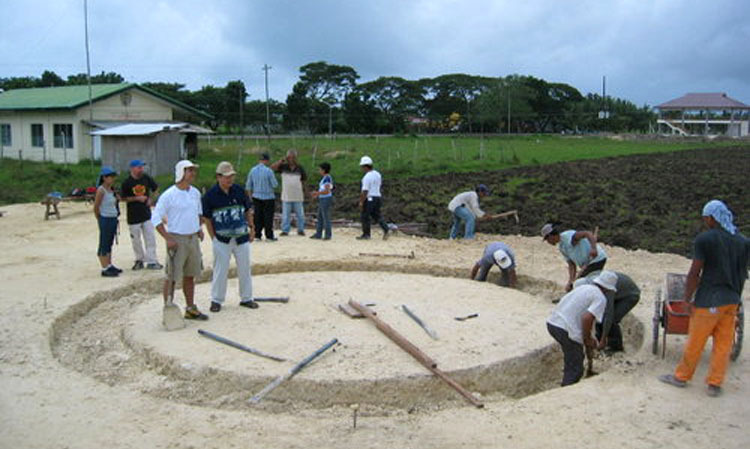 It became host to the first earth bag shelter system in the country. 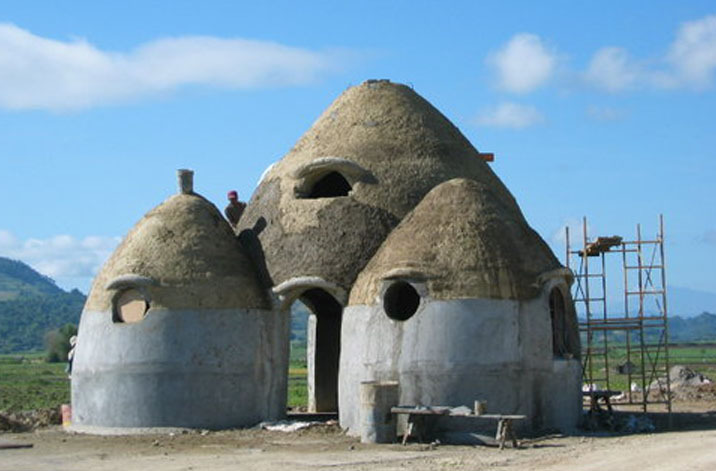 This is the "sole" purpose of my proverbial travel itch: to finally see the dome "houses". After buying some bottled water, I hailed a tricycle and asked to be taken to the site where the dome "houses" are situated. The driver looked confused and asked me for further description. ...[I asked about] domes as roof rather that the usual galvanized iron. With the spark of recognition, he said he knew of only one house that fitted my description. Much to my chagrin, the driver was indeed correct in saying that there is only one structure with a dome in Escalante. 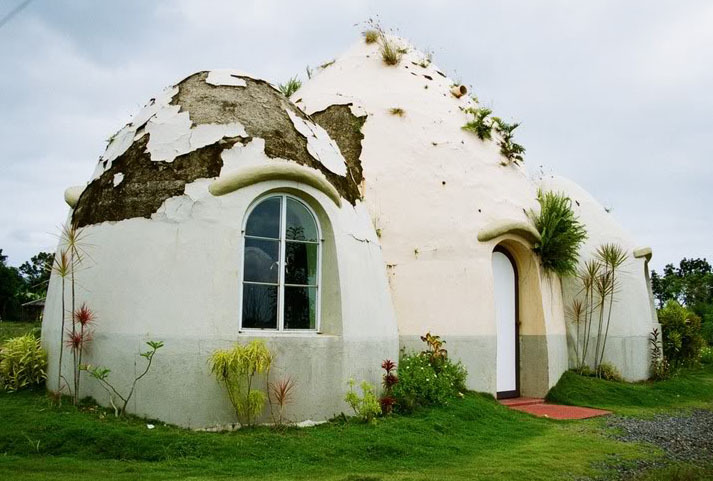 The house stood with its faded paint and with ferns sprouting in its now parched dome near the hall of Barangay Fe, just beside the national highway leading to the city proper. 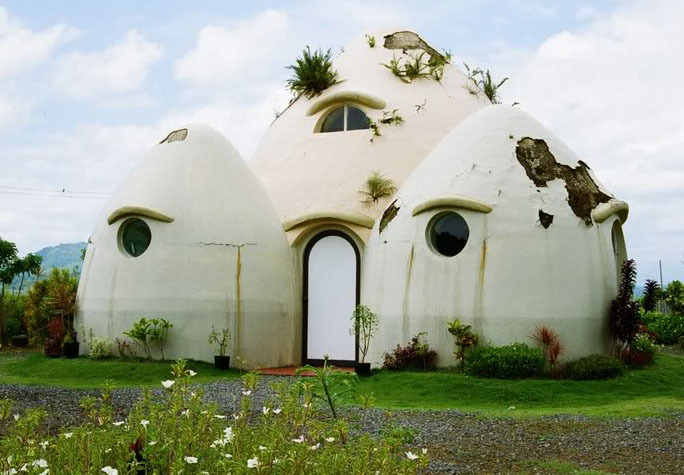 I instantly recognized it from the television shows I've seen where Illac Diaz (the proponent of the dome house) was shown coming out of its door unto the gravel yard. 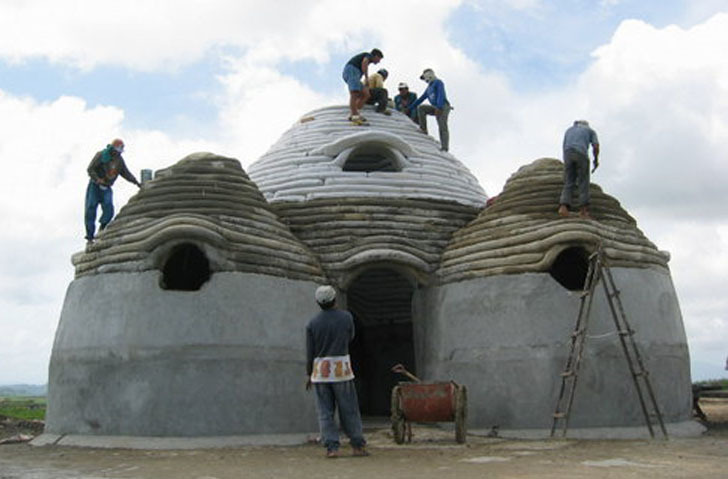 With the hype...in my mind I assumed that the project of the earth bag shelter or dome house was successful and was eventually proliferated into a village of dome houses. I was embarrassingly wrong. The house now is a picture of a structure crying out with impending structural failure. 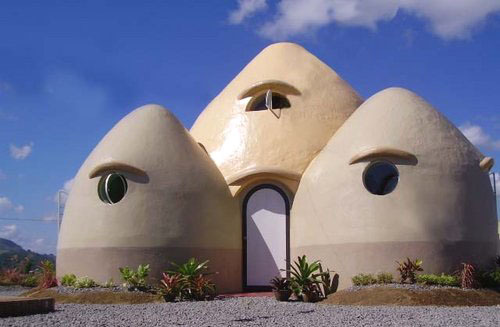 After the media hype for this dome house, I wondered what could have gone wrong. I could sense that the intent was good but it seemed that this project lacked the proper follow through and no proper maintenance procedures were set. This is after all, a prototype whose failure or success could spell out proliferation or termination. 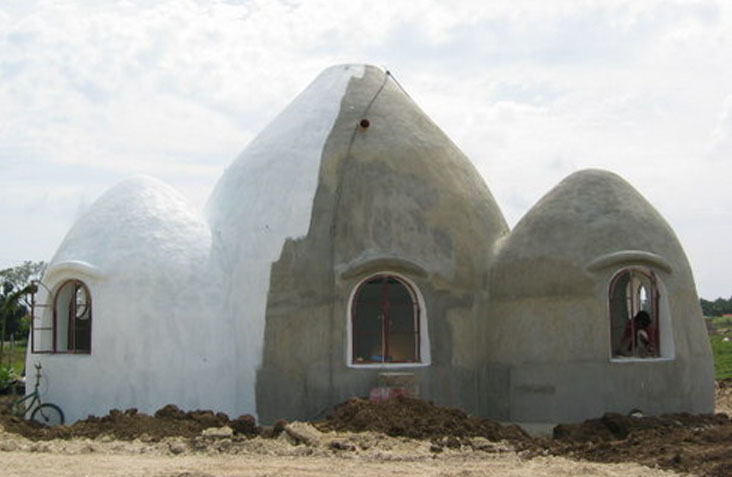 The domes are parched, with layers of cement slowly flaking off and the exposed layers becoming brittle through weathering. Cracks in its walls are visible even at a distance with signs of water ingress reaching its iron structural frame due to the presence of rust stains outside of the walls. Add to the demise these factors brought is the rich presence of ferns growing on top of its domes. The natural acids in the roots of these pteridophytans may contribute to the progressive cement disintegration of the dome structure. 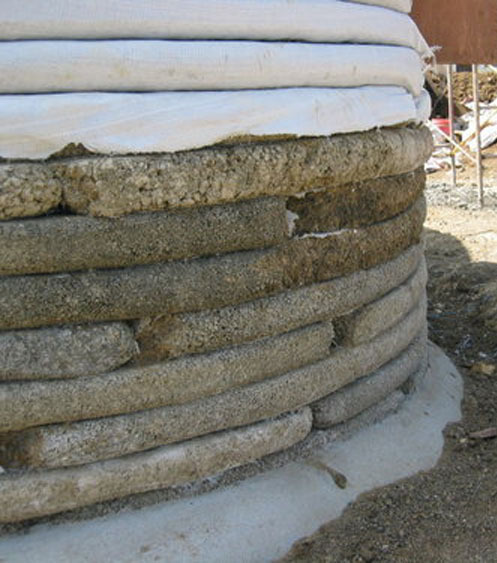 Editor's Note: Obviously the final layer of plaster did not adhere to the mud fill that was applied over the cured cement-stabilized earthbag structure. 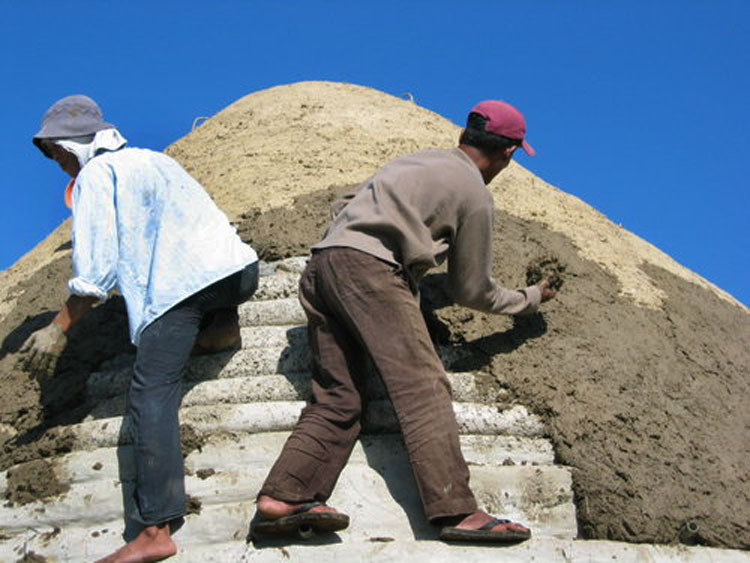 Plants are now growing naturally in this earthen medium; the seeds or roots may have been present at the time it was applied. 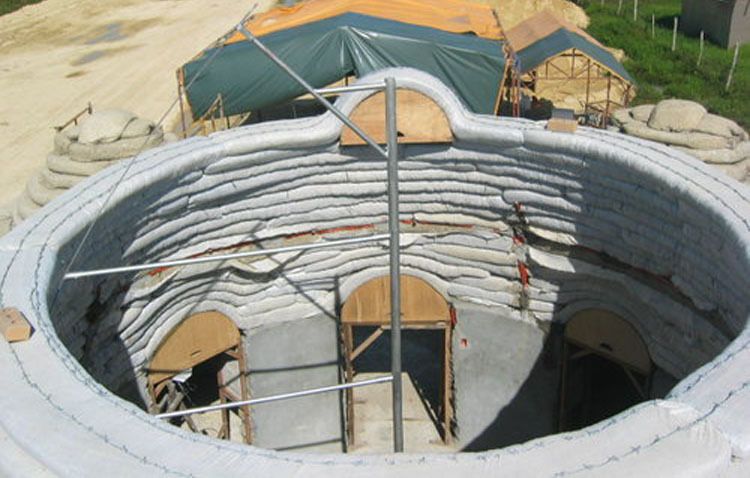 What this indicates to me is that the intermediate mud plaster was a mistake, and it should have been replaced by more stabilized material like what was placed in the earthbags. 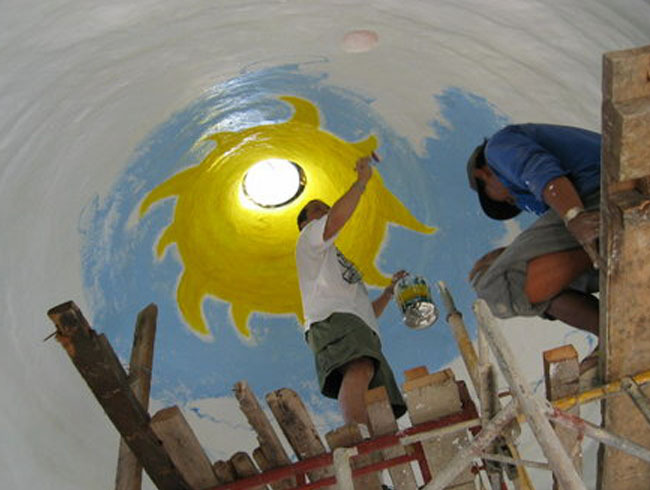 Then the final color coat of compatible plaster would likely have remained intact, and nothing would be growing up there. It is a sad commentary that despite such a lovely structure having been built, there is not sufficient interest, or follow-through to remedy the situation and salvage the entire building.